Outside of normal surgery hours the emergency cover is provided by South West Ambulance Foundation Trust who will arrange for a doctor to call you to decide whether telephone advice, going to the treatment centre or a visit is necessary. After 6.30pm on weekdays or on Saturdays, Sundays and Bank Holidays, ring the number for any of the practice sites and listen to the recorded message or you may ring 111 to get direct to the out of hours service. When should I use this service? Remember: If it is a medical emergency – If you believe that you, or a member of your family might die if you don’t get medical help immediately – then you should call 999 and ask for an ambulance. What will happen when I ring the Urgent Care Service? The best solution to a minor medical problem might be to give you some advice over the telephone. This is generally the quickest and most convenient solution if you are concerned about your medical problem. It may be decided that you need to see a healthcare professional and you will be asked to go to your nearest local treatment centre. This is because the centre will have the equipment and facilities you may need. A doctor, nurse or emergency care practitioner will also be on site and will be able to examine you more closely. You will be given a choice of which local treatment centre is best for you to go to. Our nearest is at the Westminster Memorial Hospital, Shaftesbury. A doctor, a nurse, or an emergency care practitioner may tell you that you need a home visit. This will depend upon the seriousness of your condition. A doctor, nurse or paramedic will visit you as quickly as possible, but your visit will be placed in order of priority according to the seriousness of other patients needing home visits. When you call the Urgent Care Service, if staff at the call centre, or the doctor feels that your medical problem is an emergency, they will call 999 on your behalf and an emergency ambulance will come to you. What happens if I feel better or worse? Can I call the service back? 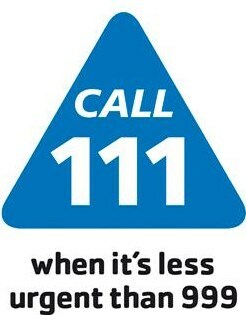 Call NHS 111 again so that the doctor can re-assess your medical condition and consider whether you need more urgent help. No longer need a visit your home by a doctor, nurse or emergency care practitioner. Have changed your mind about which local treatment centre to attend. What do I do when my nearest local treatment centre is closed? During the night, you could be asked to visit another treatment centre. However, if you need a doctor, nurse or paramedic to visit you at home they will do so. South West Ambulance NHS Foundation Trust operates the Urgent Care Service, Dorset & Somerset. If you have any queries or concerns about this service please call Sarah Parker, Patient Advice Liason Service Coordinator, South West Ambulance NHS Foundation Trust, Ringwood Road, St Leonard’s, Dorset, BH24 2SP. Tel: 01202 851657.